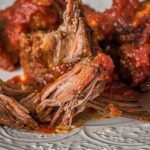 Braised Short Ribs, these baked short ribs are fall off the bone tender in a hearty tomato sauce. 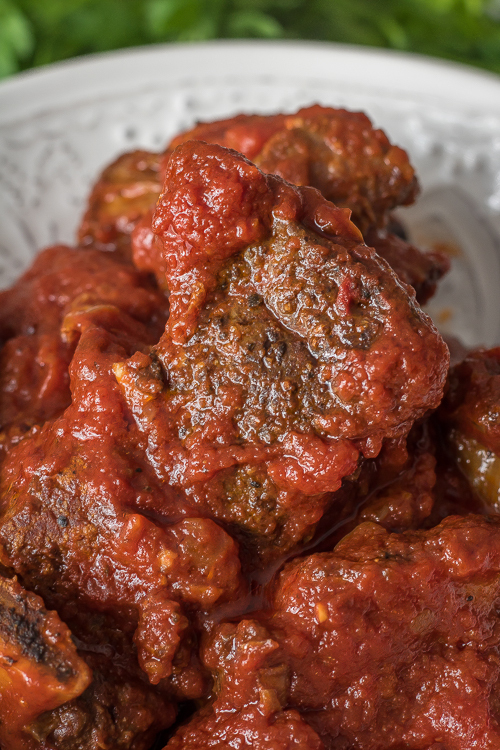 Talk about one heck of a Sunday gravy! Braised short ribs…. the name just sounds comforting, doesn’t it?! Short ribs are one of those dishes that seems super fancy to me. A lot of the time you will find them in a hearty stew or paired with a red wine reduction sauce. This version, I mixed it up a bit. 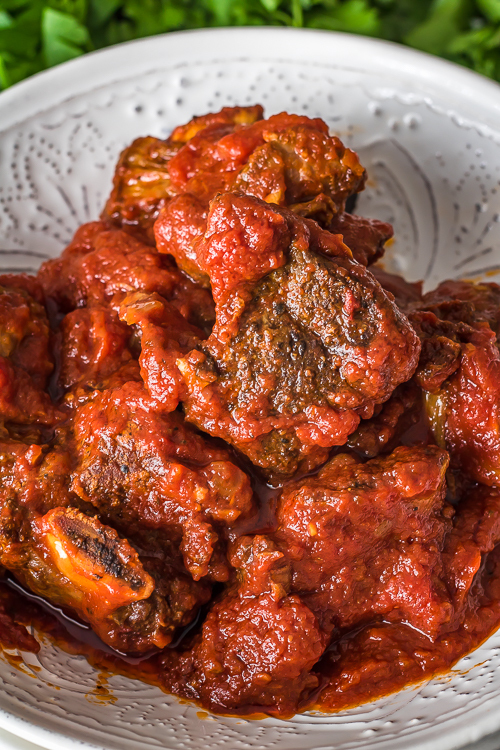 To me, there is no better “gravy” or pasta sauce than one cooked with some form of beef. That way, you get all those yummy flavorful juices that run off the beef right into your sauce. It just adds a depth of flavor you can’t find in a regular marinara. I saw these short ribs on sale at the store (score! ), so I picked up a pack and decided to try them in a tomato sauce. I was really craving some pasta that day… can you blame me?! 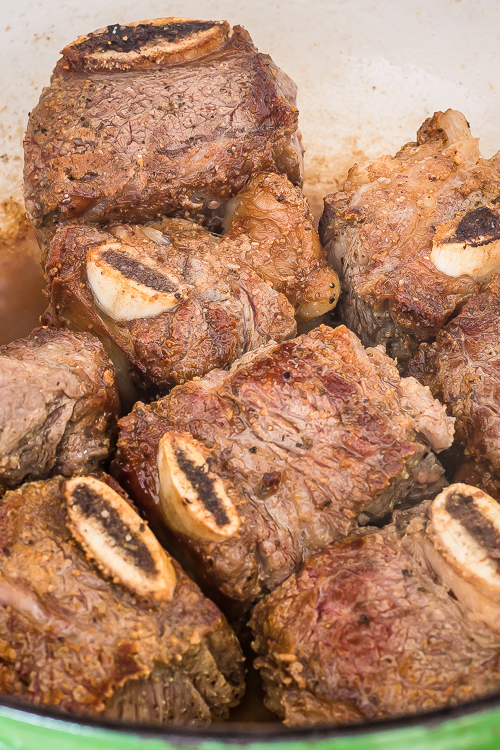 • In a dutch oven, sear seasoned short ribs on all sides until golden brown. • Remove from pan, deglaze with white wine (swoon), add onions and garlic and cook down. 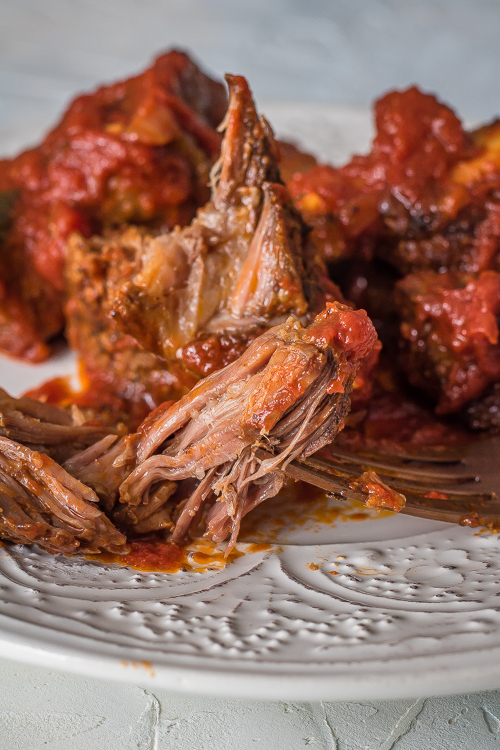 • Add tomato paste and sauce, add ribs back into the pan and bake until fall off the bone tender. • Serve over pasta, mashed potatoes or rice and dig in! You HAVE to sear the ribs first. Have to. DO NOT SKIP THIS STEP. It adds another dimension of flavor. That’s what we are doing here, adding layers of flavor and that’s what makes a knock-out dish! These are SO tender, make them this weekend, you will thank me later! Please visit my blog, ThisSillyGirlsKitchen.com for even more yummy recipes! You can eat this with pasta, or with some hearty bread. This is a great recipe for a cold day. It cooks for hours in your oven, so your house is warm and soon your heart will be as well, when you start digging in this melt-in-your-mouth delicious dish. Sprinkle salt and pepper over ribs, on both sides and rub them. Heat up 2 tablespoons of olive oil in a large Dutch oven over medium-high heat. Add ribs to hot dutch oven and get a nice sear on all sides, flipping them over to brown on all sides. This will probably take about 10-20 minutes. Remove ribs to a plate and add ¼ cup white wine to deglaze the pan. Scrape the bits from the bottom of the pan. Once the wine has almost evaporated, lower the heat to medium and add onions and garlic to the pan. Add a little more oil also, if you find necessary and if your pan is too dry and the onions are sticking to the bottom. Cook for 4 minutes. Add the tomato paste and stir to combine. Add in the tomatoes and bring to a boil, add salt and pepper to taste, return ribs to the pan. Put the lid on and place the pot in the oven. Let it braise low and slow for 4-5 hours. I like to check at the 4-hour mark and see if it’s falling apart from the bones, trust me, you’ll know when it’s ready. Once you remove from the oven, let it cool for a little bit. Skim fat off with a ladle and then it will be ready to serve. A little pro-tip: this is great to make ahead because the flavors will develop overnight in the fridge and the fat will solidify on top, making it easy to remove it once cooled. Variations: before adding the onions and garlic in, fry 4 oz of diced pancetta or bacon in the pan and then add the onions and proceed with the rest of the recipe.